A NEW property development company, Vantage Lifestyle Sdn Bhd, is going all-out to stamp its mark in the competitive Segambut high-end residential market with its maiden project, The Serai. Not only is its pricing about half that of similar upmarket homes in neighbouring Mont’ Kiara and Segambut, it is offering The Serai to be assessed by the Building and Construction Authority of Singapore under its stringent Construction Quality Assessment System (Conquas). 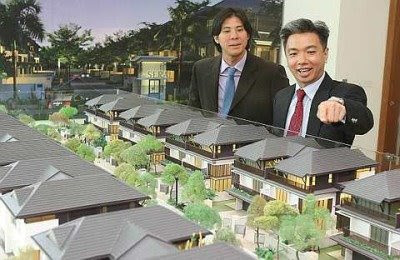 “We believe we are the only small developer that will be assessed under Conquas,” he said during a tour of the semi-detached showhouse in Segambut recently. The Serai (lemon grass), a gated and guarded freehold development, comprises two units of three-storey bungalows priced from RM3.2mil, and 28 units of three-storey semi-detached houses priced from RM1.65mil each. The bungalows, on land sizes from 7,912 to 7,632 sq ft , have about 6,000 sq ft of built-up area with their own pool. The semi-detached houses have land sizes of about 3,200 sq ft and a built-up area of 4,632 sq ft. Monthly maintenance charge is RM350. The luxuriously furnished showhouse is available for sale at RM2.65mil after a 3% discount. The double-volume living area enhances the perception of grandeur with the right furnishing and curtains. There are also a lot of thoughtful details, some of them too small to notice. For example, external metal louvres on the upper portion of the tall tinted glass panels cuts off excessive sunlight. Double-section sliding doors are used with tiny slots to drain off any rain water collected in its tracks. Top marks go to the huge master bedroom and ensuite master bath with shower area, deep long bath and double basins that occupy 840 sq ft of the top floor. This does not include two timber deck areas and balcony. There are three spacious bedrooms on the first floor and two more on the ground floor, including a maid’s room. In all, there are five bathrooms and a powder room. Besides the current 3% discount and about RM60,000 in interest savings from a 10:90 payment plan, buyers also get extra features worth over RM100,000, including three-phase power supply, pneumatic booster pump, automatic gate system, plaster ceiling, hot water system, Astro points to the living room, family hall, master bedroom and master bath (where you can watch TV in your long bath), and tempered glass shower screen in all the bathrooms. These homes are ideal for people in their 40s and 50s with two or three children. The guest room on the ground floor can be used for the elderly or as a study. About 60% of the 30 homes have been sold since the project was soft launched on Oct 18 with most of the buyers being upgraders from around the area. Although it may not have the prestigious Mont’ Kiara or Sri Hartamas names, it is actually quite accessible to these areas via Jalan Segambut and a proposed link to Mont’ Kiara via Persiaran Prima Pelangi. Several new developments have been completed, under construction as well as being planned in the vicinity of The Serai. Across the road from The Serai are some newly completed terrace houses and further away are the newly completed Anjung Tiara semi-detached homes on a hillside, some shophouses and the freehold Bukit Seri Bintang (nearing completion) project by Ipoh-based Total Resources Sdn Bhd. Bukit Seri Bintang comprises 26 units of 2½-storey terrace houses priced from RM638,000 to RM988,000 and six semi-detached houses priced from RM928,000 to RM1.4mil. The upmarket Desa Parkcity, on the other side of a hill, forms the backdrop for The Serai. “Since we bought our land, the land cost have shot up by 40%. The price of land is now about RM100 psf,” said Ong, who plans to do similar developments in the Klang Valley. His two other partners are brothers Bernard and James Keet. Looks like the trio have done their homework well which is based on what Ong described as building for a target market. MALAYSIAN malls are expected to grow their income further in 2009 with more visitors despite the anticipated slower economy. President of the Malaysian Association for Shopping and Highrise Complex Management (PPK) Joyce Yap said a higher traffic would cushion the decline in spending. "However, the extent at which they grow would depend on their tenant mix such as whether they are in fashion, food or if they retail home products," she told Business Times in an interview. According to Yap, even during the 1997/1998 financial crisis, many shopping complexes had in fact recorded an increase in traffic. 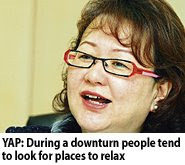 This is because during a downturn, consumers tend to look for places to relax, Yap said. "During the 1997/1998 crisis, business at food and beverage outlets (within malls) shot up. Visitorship continued on an uptrend in malls, although spend per person had declined," she said. There is usually a shift in priority of what consumers spend on, but they hardly cut down on food. Malls that tend to perform better are those that are well designed, offer variety and are well managed. Shopping complexes that aggressively promote and have retailers who offer more than just discounts also do well. These include providing gifts with purchases, free services or have tie-ups with bank cards to offer additional value. In the current environment, it is also best not to cut promotional budget. Rather, one should look at improving services and having cross promotions within shopping zones. "Malls within Mutiara Damansara, or within Bandar Utama and those shopping complexes in the Golden Triangle can do cross-promotions," she said. General manager for marketing at Pavilion KL Kung Suan Ai said she believes the Pavilion will do well in 2009 as it is always working on making the mall attractive. "In 2009, we will improve our concierge service. We are working on retailers providing delivery services to hotels for purchases made by tourists," she said. With all these in place and its recent Malaysia Property Award 2008 for Retail Development, given by the Malaysian Chapter of Fiabci, Pavilion hopes to increase the patronage level to 2.4 million a month in 2009 from 2.2 million a month this year. The supply of shopping centre space in the Klang Valley is expected to slow over the next three years as developers put projects on hold as it is now tougher to raise funds. At the same time, some developers have stalled projects as a knee-jerk reaction due to fears of the slowing global economy while others are waiting for raw material prices to fall. Regroup Associates has projected that in Klang Valley there may be only 1.47 million sq ft of net lettable area in 2009, down by 400,000 sq ft projected in the first half of the year. In 2010, only half, or 2.16 million sq ft of net lettable area, will be ready as opposed to 2.63 million sq ft which was supposed to come on stream in 2010. However, opportunities are still available even during an economic downturn, said Regroup Associates managing director Allan Soo. "Developers should view things objectively and look for opportunities. "Those who do so will see actual opportunities during a recession as retail demand can be created," Soo told Business Times. According to Soo, there are still unserved communities and opportunities to create something new. He cited Cheras as an example where more malls can be developed and where funds are likely to come and buy these properties in the future. Moreover, during difficult times, there is less competition in the markets and costs of construction are also lower. One could do something that caters to trends of the future, Soo added. "Consumers go for experience and a good time. This is called experiential retail. If developers continue to build yesterday's mall, it is bound to fail," he said. Soo also pointed out that successful malls are not necessarily Grade A shopping malls. "Success which is measured by traffic, rents and profits are even made by hypermarkets," he pointed out. MALAYSIA'S shopping malls continue to be on the radar of foreign investors despite a global economic slowdown. This is due to the fact that the Malaysian retail industry is mature, coupled with the likelihood of obtaining bargains during a slowdown, property consultants said. "Retail centres are very good long-term investments. They provide the extra in terms of dynamism, the mall can be repositioned and (space) rejigged," Regroup Associates managing director Allan Soo said. "Despite the onset of a worldwide recession and the pressure on funding, interest in retail centres is increasing," Soo told Business Times in an interview. "We (Regroup) continue to get enquiries (to buy). We have at least three foreign funds who are keen on retail centres in Malaysia," he said, adding that funds start from RM100 million up to those with an unlimited budget. Soo explained that during a recession, there are more sellers and less buyers. "Therefore yield goes up as price comes down. Instead of the usual five per cent to seven per cent yield that one hopes to get from a purchase, buyers are now hoping for a nine per cent yield," he said. Yield measures the return for a buyer. In this instance, it is income from the property relative to the value of the asset. However, as fund raising becomes more difficult during an economic slowdown, some investors hold back their investment as they expect prices to come down further. "Some funds are reviewing their strategy ... they are looking for the right time to purchase," he said. He said that in 1998, foreign investors continued to be interested in Malaysia. There were "vulture funds" coming in to buy malls at huge bargains. Real estate consultant Savills Rahim & Co's managing director Robert Ang feels that while interest in our malls will continue, Malaysia will face competition from other markets, especially those where prices have declined drastically. "Yes, interest from foreign companies and foreign funds in our malls will continue ... (but) there are many other opportunities elsewhere in other countries too," Ang said. He pointed out that at this point there are no "juicy malls" in prime locations available. However, Soo contends that there is a lack of properties for sale in Southeast Asia, which means that Malaysia will remain attractive. "In this region, there is not that much availability coming up. What is there available in Hong Kong and Singapore?" he asked. "Compared to India and China, though these markets are growing, they are not as matured. Malaysia has three decades of retail development," Soo said. But is it good to sell most of our retail centres to foreigners? According to Soo, it creates value for the asset as it brings in foreign investment. "These investors cannot take away the asset. They may resell to a Malaysian or to another foreigner, but they can't take the property away," he pointed out. Ang agreed, saying that there are still developer-managed malls which are poorly run. "When funds come in, they offer a different kind of expertise which keeps the level of management high," he said. The slump in building material prices will not only benefit contractors but also save the Government a significant amount of money. In the middle of this year, the Government agreed to include the variation of price (VOP) clause into design-and-build projects on a 50:50 basis instead of limiting it to conventional contracts. The list of claimable items was expanded to 11 from five previously due to the escalating prices of building materials. Since then, these prices have declined significantly. Master Builders Association Malaysia president Ng Kee Leen said the VOP clause allowed either party to claim back any cost savings or shared any cost increases. “The Government can claim back from contractors if the building material prices had fallen below the base price as at Jan 1, 2008,” he told StarBiz. Profit margins were little impacted as these were accounted for in the project bids and contracts, he added. However, with the exception of petrol prices, the rest of claimable items were currently still above or hovering around the base price, Ng said. An analyst at a brokerage said compensation to the Government, if any, would not affect contractors’ earnings. For conventional projects, which are on tender basis, the margins are protected from fluctuating material prices as contractors can make a full claim if the costs are higher than a certain threshold. For design-and-build projects, contractors can benefit about 50% from the price fall, or lose 50% of the price increase. “Nonetheless, the companies that I’ve spoken to indicated that they have not made any claims for VOP this year,” he said. A research house, in its report, said the near-term outlook of the construction sector had improved due to the sharp drop in prices of raw materials like steel, oil and bitumen, which would ease margin pressure. The prospects for replenishing order book had also improved with the Government’s pump-priming initiatives. Earnings of construction companies in the third quarter, however, were still impacted by the higher cost of building materials as some of these inventories were locked in earlier, the research house said.